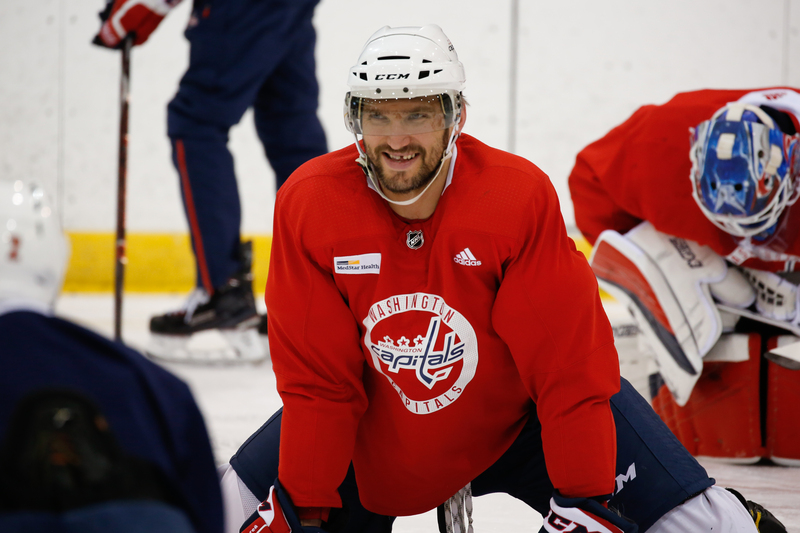 Sunburned and rested, the Capitals returned to work Thursday afternoon at MedStar Capitals Iceplex for their first practice since the All-Star Game and bye-week break. The Capitals will host the Calgary Flames Friday night at Capital One Arena. Puck drop is set for 7:00 PM. Christian Djoos continued practicing with the Capitals on Thursday. However, today was the first day he participated without a non-contact (light blue) jersey. Djoos has been out of the lineup since December 11, when he suffered a leg injury against Detroit. Djoos’ return gives the Capitals eight defensemen on the roster, so there will likely be a move coming when Djoos is ready to return to the lineup. Alex Ovechkin will miss Friday night’s tilt as a result of his mandatory one-game suspension for missing this years All-Star game. Ovechkin’s career-best streak of playing in 214 consecutive regular season games will end. Last time he didn’t play was the final game of 2015-16, when he sat out vs. Anaheim (rescheduled game due to snowstorm) to rest for playoffs. Alex Ovechkin will serve his one-game suspension for skipping the All-Star Game when the Capitals host the Calgary Flames tomorrow night. He’s missed just 29 games in his career. Caps’ power play without Ovechkin: Tom Wilson in the “diamond” (the slot) and Oshie is in the left faceoff circle, where Ovechkin would usually be. The first-place Calgary Flames arrived in town early Wednesday afternoon. Their last game was a 3-2 overtime win over the Hurricanes in Raleigh on Tuesday, January 22. The Capitals have not played since Wednesday, January 23. Alex Ovechkin on having to miss tomorrow for skipping All-Star: “ask Gary about it” because it’s NHL rule. Djoos stayed here and skated during the bye week. He said he’s taking it “day by day” and is “feeling good.” Today was his first full (with contact) practice. Nicklas Backstrom is entering tomorrow’s game versus the Calgary Flames after recording his 50thpoint (13g, 38a) of the season on Jan. 23 against the Toronto Maple Leafs, joining Alex Ovechkin (37g, 20a) as the only Capitals with at least 50 points. That marked the 10th time Backstrom and Ovechkin have recorded 50 points in the same season, joining Pittsburgh’s Evgeni Malkin and Sidney Crosby (2006-07 through 2018-19) and Chicago’s Jonathan Toews and Patrick Kane (2007-08 through 2017-18) as the only active teammates to accomplish the feat. Since entering the NHL in 2005-06, Ovechkin’s 644 goals lead the NHL, 211 more than Crosby, who ranks second in the NHL in goals since 2005-06, while Backstrom’s 628 assists rank second in the NHL since 2007-08, 28 more than Vancouver’s Henrik Sedin, who ranks second in the NHL during that time frame. This entry was posted in News and tagged Alex Ovechkin, Calgary Flames, Christian Djoos, Jon Sorensen, Medstar Capitals Iceplex, Washington Capitals Practice. Bookmark the permalink. I’m sure Stephenson and Djoos will carry them to victory tomorrow night against Calgary. Well rested and sunburn will that be enough to pick up their play for the start of the second half. I need to see improved play in both the offensive and defensive zones on the ice. Is the talent there this season I certainly think so! But to impose their will on the ice has that diminished. Well “Let’s Rock The Red” and see how far it takes us the rest of this 2018 – 19 season. Optimism, I love it ! I agree. I wonder how many games he really has to turn it around.